Switzerland – Much to the excitement of prog fans worldwide, Swiss neo-prog ensemble Clepsydra will be releasing a limited edition box set containing the group’s critically acclaimed albums ‘Hologram’, ‘More Grains of Sand’, ‘Fears’ and ‘Alone’. To be released in January 2014 by Swiss label Galileo Records LTD, and distributed and marketed by Gonzo MultiMedia, the 4-CD box set titled ‘3654 Days’ will contain all 4 albums meticulously remastered. Also added, an hour of additional unreleased and bonus material. This will include live recordings, demos, unreleased alternative mixes and unreleased alternative versions. A 12″x12″ book with rare photos and the history of the band will also be included. The box set will be a limited run of 1000 copies and will contain a certificate of authenticity, hand signed by all the band members. The brilliant artwork is done by Mark Wilkinson, who is best known for his work with Iron Maiden, Judas Priest and Marillion. In 1991 Clepsydra released their first album ‘Hologram’, which was followed by the EP ‘Fly Man’ in 1993. Clepsydra then signed to InsideOut, who released their second album ‘More Grains of Sand’ in 1994. This CD included the song “Moonshine on Heights”, which by many is regarded as neo-prog classic. 1994 also saw them performing two songs on national Swiss TV, a rare occurrence for a progressive rock band at that time. In 1998 Clepsydra released their third album ‘Fears’, the first album with Marco Cerulli on guitar. In the wake of the album release Clepsydra had a 10 day long European tour and was booked for a concert in Canada on the strength of this production. In 2001 the band released ‘Alone’ with Nicola De Vita on bass. This album came with 3 different album covers: “The Chicken”, “The Octopus” and “The Fish”. Following these four albums Clepsydra entered a state of hiatus. At this point they had established themselves as a popular entity among fans of neo-progressive rock, and they were often compared to the likes of Jadis, IQ and Fish-era Marillion. In 2013 Clepsydra announced they were reuniting, with Andy Thommen back on bass guitar and a reunion tour scheduled for 2014. Concerts in Poland and Switzerland will be announced soon. A small detail of note in the band history is that renowned surrealist artist H. R. Giger, known for his concept art for the Hollywood blockbuster movie Alien and a number of album cover art productions for artists such as Deborah Harry, ELP and Celtic Frost, provided a holographed object for Clepsydra’s debut album ‘Hologram’. 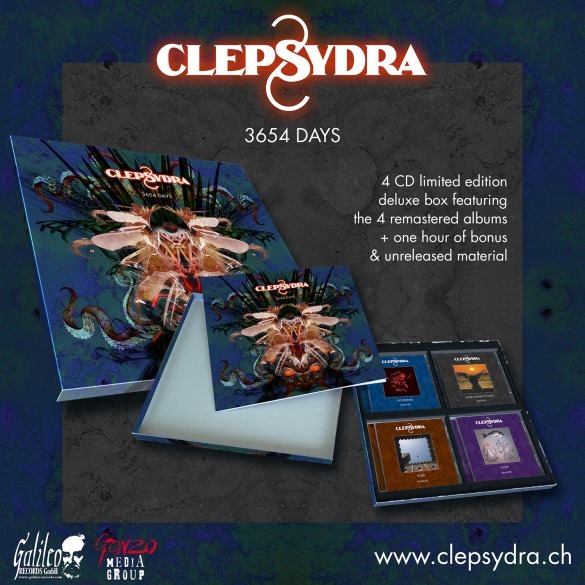 Clepsydra’s ‘3654’ box set (GLR118BOXCD) will be released in January 2014, for pre-order information visit the band’s website. This entry was posted on Friday, November 15th, 2013 at 00:00	and posted in Clepsydra, Press Release. You can follow any responses to this entry through the RSS 2.0 feed.